The World's Billionaires is an annual ranking by documented net worth of the world's wealthiest billionaires compiled and published in March annually by the American business magazine Forbes. The list was first published in March 1987. The total net worth of each individual on the list is estimated and is cited in United States dollars, based on their documented assets and accounting for debt. Royalty and dictators whose wealth comes from their positions are excluded from these lists. This ranking is an index of the wealthiest documented individuals, excluding and ranking against those with wealth that is not able to be completely ascertained. The net worth of the world's billionaires increased from less than $1 trillion in 2000 to over $7 trillion in 2015. In 2018, there was a record of 2,208 people on the list, that included 259 newcomers mostly from China and the U.S.; there were 63 people under 40 and it had a record number of 256 women. The average net worth of the list came in at US$4.1 billion, up US$350 million from 2017. Added together, the total net worth for 2018's billionaires was US$9.1 trillion, up from US$7.67 trillion in 2017. As of 2018[update], Microsoft founder Bill Gates had topped the list 18 of the past 24 years, while Amazon founder Jeff Bezos is ranked at the top for the first time and he became the first centibillionaire included in the ranking. Additionally, Mark Zuckerberg is currently the only person in the top 10 billionaires list who is under the age of 50, and the only one in the top 20 billionaires list who is under the age of 40. In 2017, 500 of the richest people in the world became richer by $1 trillion, according to a report by Bloomberg News. According to a 2017 Oxfam report, the top eight billionaires own as much combined wealth as "the poorest half of the human race". Each year, Forbes employs a team of more than 50 reporters from a variety of countries to track the activity of the world's wealthiest individuals. Preliminary surveys are sent to those who may qualify for the list. According to Forbes, they received three types of responses – some people try to inflate their wealth, others cooperate but leave out details, and some refuse to answer any questions. Business deals are then scrutinized and estimates of valuable assets – land, homes, vehicles, artwork, etc. – are made. Interviews are conducted to vet the figures and improve the estimate of an individual's holdings. Finally, positions in a publicly traded stock are priced to market on a date roughly a month before publication. Privately held companies are priced by the prevailing price-to-sales or price-to-earnings ratios. Known debt is subtracted from assets to get a final estimate of an individual's estimated worth in United States dollars. Since stock prices fluctuate rapidly, an individual's true wealth and ranking at the time of publication may vary from their situation when the list was compiled. Family fortunes dispersed over a large number of relatives are included only if those individuals' holdings are worth more than a billion dollars. However, when a living individual has dispersed his or her wealth to immediate family members, it is included under a single listing provided that individual is still living. Royal families and dictators that have their wealth contingent on a position are always excluded from these lists. The rankings are published annually in March, so the net worth listed are snapshots taken at that time. These lists only show the top 10 wealthiest billionaires for each year. Has not changed from the previous ranking. Has increased from the previous ranking. Has decreased from the previous ranking. In the 33nd annual Forbes list of the world's billionaires, the list included 2,153 billionaires with a total net wealth of $8.7 trillion, down 55 members and $400 billion from 2018. The U.S. continued to have the most billionaires in the world, with a record of 609. Kylie Jenner, at 21 years old, was included in the 2019 list for the first time. Jenner is currently the youngest billionaire in the world and the youngest self-made billionaire of all time. Jenner's source of wealth is Kylie Cosmetics. In the 32nd annual Forbes list of the world's billionaires, the aggregate wealth of the top 20 richest people on Earth amounts to about 13 percent of all billionaires' fortunes combined. A record of 2,208 billionaires were in the ranking and the total wealth was $9.1 trillion, up 18% since 2017. For the first time, Jeff Bezos was listed as the top billionaire due to Amazon's rising stock price that resulted in one person's biggest one year gain in wealth ($35 billion) since Forbes started tracking in 1987. The U.S. had the most billionaires in the world, with 585, while China is catching up with 476 (when including Hong Kong, Macau and Taiwan). On the 30th anniversary of the Forbes' list of the world's billionaires, for the fourth year in a row, Bill Gates was named the richest man in the world. In 2017, there was a record of 2,043 people on the list, which is the first time over 2,000 people were listed, that included 195 newcomers of whom 76 were from China and 25 from the U.S.; there were 56 people under 40 and it had a record of 227 women. The number of billionaires increased 13% to 2,043 from 1,810 in 2016; this is the biggest change in over 30 years of tracking billionaires globally. Added together, the total net worth for 2017's billionaires was US$7.67 trillion, up from US$7.1 trillion in 2015. This is the first time after 12 years that Carlos Slim was not within the top five. The U.S. had the most billionaires in the world, with a record of 565. China had 319 (not including Hong Kong or Macau), Germany had 114, and India had the fourth most with 101; India had reached over 100 billionaires for its first time. For the third year in a row, Bill Gates was named the richest man in the world by Forbes' 2016 list of the world's billionaires. This is the 17th time that the founder of Microsoft has claimed the top spot. Amancio Ortega rose from last year's position of number four to second. Warren Buffett of Berkshire Hathaway came in third for the second consecutive time, while Mexican telecommunication mogul Carlos Slim slipped down from last year's second position to fourth. Jeff Bezos of Amazon, Mark Zuckerberg of Facebook and Michael Bloomberg of Bloomberg L.P., appear for the first time on the Forbes top 10 billionaires list, coming at fifth, sixth and eighth position, respectively. Zuckerberg became the youngest top 10 billionaire this year at the age of 31. Larry Ellison, Charles Koch and David Koch also slipped down from their last year's positions, with Ellison dropping to seventh from fifth and the Kochs falling to ninth position from sixth, respectively. In the 29th annual Forbes list of global billionaires, a record 1,826 billionaires were named with an aggregated net worth of $7.1 trillion compared to $6.4 trillion last year. 46 of the billionaires in this list are under the age of 40. A record number of 290 people joined the list for the first time, of whom 25 percent hail from China, which produced a world-leading 71 newcomers. The United States came in second, with 57, followed by India, with 28, and Germany, with 23. The United States has the largest number of billionaires with 526. Russia went down to 88 from 111 in 2014. Russia was placed behind China, Germany and India by the number of billionaires. Self-made billionaires made up the largest number of people on the list with 1,191 positions (over 65 percent) while just 230 (under 13 percent) have wealth through inheritance. The number of billionaires who inherited a portion but are still working to increase their fortunes is 405. Bill Gates was named the richest man in the world by Forbes' annual list of the world's billionaires. This was the 16th time that the founder of Microsoft claimed the top spot. Carlos Slim came in second for the second consecutive time. Warren Buffett of Berkshire Hathaway was placed third, while Amancio Ortega of Spain, slipped down a position from last year to number four. Larry Ellison, the founder of Oracle rounded off the top five. Christy Walton was the highest-ranking female at number eight. America's Evan Spiegel, co-founder of photo messaging app Snapchat became the youngest billionaire this year at the age of 24. At age 99, David Rockefeller maintained his position as the oldest billionaire to be included in the list. Mark Zuckerberg, the founder of Facebook, rose to number 16 with $33.4 billion. Iceland had a billionaire, Thor Bjorgolfsson, in the list after a gap of five years. Guatemala had a billionaire, Mario Lopez Estrada, for the first time in its history. Gates added $9 billion to his fortune since 2013 and topped the Forbes 2014 billionaire list. He has topped the list 15 of the previous 20 years, but his previous number one ranking was in 2009. Mexican telecommunication mogul Carlos Slim came in second place after being number one the previous four years. Zara founder Amancio Ortega placed third for the second consecutive year. American investor Warren Buffett was in the top five for the 20th consecutive year, placing fourth. America's Christy Walton was the highest ranking woman, placing ninth overall. Aliko Dangote of Nigeria became the first African ever to enter the top 25, with an estimated net worth of $25 billion. A total of 1,645 people made the 2014 billionaire list, representing combined wealth of $6.4 trillion. Of those, a record 268 were newcomers, surpassing 2008's 226 newcomers. One hundred people listed in 2013 failed to make the list. The number of women on the list rose to a record 172 in 2014. Approximately 66 percent of the list was self-made, 13 percent achieved their wealth through inheritance alone, and 21 percent through a mixture of the two. The United States had 492 billionaires on the list, the most of any country. The country also had the most newcomers with 50, and women with 54. China had the second most billionaires with 152, while Russia was third with 111. Algeria, Lithuania, Tanzania, and Uganda were all represented on the list for the first time. Turkey saw the most people drop off the list, 19, due to a period of high inflation in the country. Carlos Slim topped the 2013 billionaire list, marking his fourth consecutive year at the top. Gates remained in second, while Amancio Ortega moved up to third. Ortega's gain of $19.5 billion was the largest of anyone on the list. Warren Buffett failed to make the top three for the first time since 2000, placing fourth. Diesel founder Renzo Rosso was among the top newcomers, debuting with an estimate net worth of $3 billion. A global rise in asset prices, led Forbes editor Randall Lane to declare "It [was] a very good year to be a billionaire". However, it was not a good year to be Eike Batista who fell from seventh to 100th, suffering the largest net loss of anyone on the list. Overall, net gainers outnumbered net losers by 4:1. A record total of 1,426 people made the 2013 list, representing $5.4 trillion of assets. Of those, 442 billionaires hailed from the United States. The Asian-Pacific region had 386 billionaires and Europe 366. The list also featured a record number of newcomers, 210, representing 42 countries. Sixty people from the 2012 list fell below a billion dollar of assets in 2013 and eight others from the 2012 list died. The Asia-Pacific region had the most drop-offs, with 29, followed by the United States with 16. The 2013 list featured 138 women, of which 50 came from the United States. A majority of the list (961 individuals, 67 percent) was entirely self-made; 184 (13 percent) inherited their wealth, and 281 (20 percent) achieved their fortune through a combination of inheritance and business acumen. Vietnam's Phạm Nhật Vượng was the first person from that country to be included in this list. Carlos Slim topped the 2012 list, marking this third consecutive year at the top. Gates placed second, but narrowed the gap from 2011 as Slim's fortune fell $5 billion while Gates' rose $5 billion. Warren Buffett remained in third place. Bernard Arnault of France was the top-ranking European on the list, placing fourth. Ricardo Salinas Pliego was the greatest gainer in terms of dollars, adding $9.2 billion to his fortune and moving up to number 37 overall. Making her debut on the list at age 27, Spanx founder Sara Blakely became the youngest self-made female billionaire ever. Colombia's Alejandro Santo Domingo was the highest-ranked newcomer, inheriting a $9.5 billion stake in Santo Domingo Group from his father. India's Lakshmi Mittal was the largest loser as his fortune dropped from $31.1 billion to $20.7 billion as the price of steel maker ArcelorMittal fell sharply. As a result, he failed to make the top 10 for the first time since 2004 and lost his title of richest Asian to Hong Kong's Li Ka-shing. A record total of 1,226 people made the 2012 list, representing 58 countries. Of those, 126 were newcomers to the list and 104 were women. The United States had the greatest number of billionaires with 425. Russia had 96 people on the list, while China had 95. Georgia, Morocco, and Peru were newly represented on the list. Falling stock prices in Asia contributed to 117 former billionaires falling from the list worldwide. Twelve others listed in 2011 died. Overall, net gainers (460) barely outnumbered net losers (441). To coincide with the release of the 2012 list, Forbes announced a new "Billionaire Real-Time Ticker" updating the wealth of the world's top fifty billionaires in real time. In the 25th annual Forbes list of global billionaires, Slim added $20.5 billion to his fortune, the most of anyone, and retained his number one ranking with a total fortune of $74 billion. Gates remained in second place with $56 billion, while Warren Buffett was third with $50 billion. The top 10 had a combined wealth of $406 billion, up from $342 billion in 2010. According to Forbes editor Kerry Dolan, "media and technology billionaires definitely benefited from a stronger stock market and a growing enthusiasm for all things social" since the 2010 list. However, Nigerian commodity mogul Aliko Dangote was the greatest gainer on a percentage basis as his fortune increased 557 percent to $13.5 billion. Mark Zuckerberg was one of seven Facebook-related billionaires on the list, as he added $9.5 billion to his net worth to move up to 52nd. Facebook co-founder Dustin Moskovitz was the youngest person on the list. Aged 26, eight days younger than Zuckerberg, he debuted at number 420 with an estimated fortune of $2.7 billion. IKEA founder Ingvar Kamprad was the largest loser as he saw his fortune plummet from $23 billion to $6 billion, dropping him from 11th to 162nd overall. A record 1,210 billionaires made the 2011 list, representing a combined wealth of $4.5 trillion, up from $3.6 trillion the previous year. One third of the world's billionaires, 413, came from the United States. China had the second most billionaires with 115, while Russia was third with 101. Asia moved up to 332 billionaires, passing Europe as a region for the first time since the 1990s. The 2011 list included 214 newcomers and the average net worth of those on it increased to $3.7 billion. Slim narrowly eclipsed Gates to top the billionaire list for the first time. Slim saw his estimated worth surge $18.5 billion to $53.5 billion as shares of America Movil rose 35 percent. Gates' estimated wealth rose $13 billion to $53 billion, placing him second. Warren Buffett was third with $47 billion. Christy Walton was the highest-ranking woman, placing 12th overall, with an inherited fortune of $22.5 billion. At age 25, Mark Zuckerberg continued to be the world's youngest self-made billionaire. American Isaac Perlmutter was among the newcomers with an estimated fortune of $4 billion largely acquired in his sale of Marvel Entertainment to Disney. A total of 1,011 people made the 2010 list. The United States accounted for 403 billionaires, followed by China with 89 and Russia with 62. It was the first time China, while including Hong Kong, placed second. A total of 55 countries were represented on the 2010 list, including Finland and Pakistan which claimed their first billionaires. Eighty-nine women made the list, but only 14 of them were self-made. The combined net worth of the list was $3.6 trillion, up 50 percent from 2009's $2.4 trillion, while the average net worth was $3.5 billion. The 2010 list featured 164 re-entries and 97 true newcomers. Asia accounted for more than 100 of the new entrants. Overall, just 12 percent of the list lost wealth since 2009, and 30 people fell off the list. Thirteen others died. Of the 89 women, 12 were newcomers in 2010. Steve Forbes said the growing number of billionaires was clear sign that the world's economy was recovering from 2009's global financial crisis. In June 2010, Gates and Buffett announce the Giving Pledge that is a promise to give the majority of their wealth to philanthropy. As of 2017, the pledge has 158 signatories, but some of the signatories have since died. Most of the signers of the pledge are billionaires, and their pledges total to over $365 billion. In the wake of the Financial crisis of 2007–2008, the world's billionaires lose $2 trillion in net worth and the list becomes 30% smaller than the previous year's list. Facebook founder Mark Zuckerberg, four years after starting the company, joins the list at 23 to become the youngest self-made billionaire. Forbes recorded then record of 946 billionaires. There were 178 newcomers, as well as the first billionaires from Cyprus, Oman, Romania and Serbia. Over 66% of the previous year's billionaires became richer. 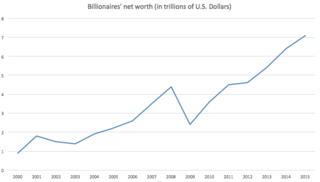 The billionaires' net worth increased in 2007 by $900 billion to $3.5 trillion. Free cash used by consumers from home equity extraction, known as the real estate bubble created a total of nearly $5 trillion in 2005, contributing to economic growth worldwide. The net worth of 2005's 691 billionaires is $2.2 trillion. More than half of them have self-made fortunes. The founders of Google, Sergey Brin and Larry Page, become billionaires at age 30. * Each hold an essentially equal share in Walmart. Oprah Winfrey becomes the first female African-American billionaire. As a result of the market crash caused by the Dot-com bubble, 83 billionaires drop off the list from the previous year. In 2001, BET founder Robert L. Johnson became the first ever African-American billionaire. * Each hold an essentially equal share in Wal-Mart. Had he been alive in 2001, Sam Walton would have been the world's wealthiest person. Gates became the first American to take the top spot of the World's Billionaires in 1995 with a net worth of $12.5 billion and he remained there during the Dot-com bubble's height in 1999 when Gates' fortune peaked at $90 billion. After the dot-com bubble started to collapse in 2000, his wealth dropped to $60 billion although he remained at the top of the list. The dot-com bubble created the most paper wealth for some billionaires. However, once the dotcom bubble burst the new rich saw their fortunes disappear. Billionaires' fortunes were hit even harder by the global financial crisis; 2009 was the first time in five years that the world had a net loss in the number of billionaires. The strong performance of the financial markets and global economic recovery have erased financial assets losses. Most of the richest people in the world have seen their fortunes soar in the early 2010s. ^ a b c d e f Kollmeyer, Barbara (4 March 2014). "Bill Gates back on top, WhatsApp founders and more women in Forbes' billionaire rankings". Market Watch, The Wall Street Journal. Retrieved 5 March 2014. ^ a b c "Billionaires 2019". Forbes. 5 March 2019. Retrieved 13 March 2019. ^ a b c d Gore, Leada (4 March 2014). "Youngest, oldest and one who can body slam you: More on Forbes list of the ultra-rich". AL.com. Alabama Media Group. Retrieved 5 March 2014. ^ "Why Putin Isn't on 'Forbes' Billionaires List". Forbes. ^ a b c d e Kroll, Luisa (6 March 2018). "Forbes Billionaires 2018: Meet The Richest People On The Planet". Forbes. Retrieved 6 March 2018. ^ a b c d e Kroll, Luisa. "Forbes 2017 billionaires list: Meet the richest people on the planet". Forbes. Retrieved 21 March 2017. ^ a b c d Dolan, Kerry A.; Kroll, Luisa (2 March 2015). "Inside The 2015 Forbes Billionaires List: Facts And Figures". Forbes. Retrieved 31 May 2015. ^ Shinal, John (1 August 2017). "Mark Zuckerberg is less than half the age of his super-wealthy peers". www.cnbc.com. Retrieved 15 January 2019. ^ Metcalf, Tom; Witzig, Jack (27 December 2017). "World's Wealthiest Became $1 Trillion Richer in 2017". Bloomberg News. Retrieved 27 December 2017. ^ Erickson, Amanda (27 December 2017). "The world's 500 wealthiest people got $1 trillion richer in 2017". The Washington Post. Retrieved 27 December 2017. ^ Ratcliff, Anna (16 January 2017). "Just 8 men own same wealth as half the world". Oxfam. Retrieved 16 January 2017. ^ Mullany, Gerry (16 January 2017). "World's 8 Richest Have as Much Wealth as Bottom Half of Global Population". New York Times. Retrieved 16 January 2017. ^ a b c Dolan, Kerry A. (7 March 2012). "Methodology: How We Crunch The Numbers". Forbes. Retrieved 4 January 2013. ^ a b c d e Krastev, Nikola (11 March 2010). "Forbes' Rich List: Number Of New Billionaires Reflects Global Recovery". Radio Free Europe Radio Liberty. Retrieved 25 March 2014. ^ "The World's Billionaires List". Forbes. 23 March 2017. Retrieved 21 March 2017. ^ "#1 Bill Gates". Forbes. Retrieved 2 January 2016. ^ "Amancio Ortega". Forbes. 27 January 2016. Retrieved 27 January 2016. ^ "The World's Billionaires : Warren Buffett". Forbes. Retrieved 3 November 2015. ^ "Jeff Bezos". Forbes. Retrieved 27 October 2015. ^ ""The World's Billionaires - Mark Zuckerberg"". Forbes. 1 March 2016. Retrieved 21 March 2016. ^ ""The World's Billionaires - Michael Bloomberg"". Forbes. 1 March 2016. Retrieved 21 March 2016. ^ Alexander, Dan (2 March 2015). "Record 290 Newcomers Join Forbes Billionaires List, Including Michael Jordan". Forbes. ^ Dolan, Kerry A. "The World's Billionaires". Forbes. Retrieved 2 March 2015. ^ "The World's Billionaires". Forbes. 3 March 2015. Retrieved 2 March 2015. ^ "Mario Lopez Estrada". Forbes: The World's Billionaires. Retrieved 19 August 2015. ^ Dolan, Kerry A.; Kroll, Luisa (3 March 2014). "Inside The 2014 Forbes Billionaires List: Facts And Figures". Forbes. Retrieved 2 June 2014. ^ a b c d e Barber, Elizabeth (4 March 2014). "Forbes' richest people: number of billionaires up significantly". Christian Science Monitor. Retrieved 4 March 2014. ^ a b c Hickman, Martin (4 March 2013). "2013 Forbes Billionaires list: Record number of new entries appear on rich list, but Carlos Slim and Bill Gates still top the charts". The Independent. Retrieved 5 March 2014. ^ a b Kollmeyer, Barbara (4 March 2013). "Forbes billionaire list 2013: Mr. Slim wins it again". Market Watch, Wall Street Journal. Retrieved 5 March 2014. ^ a b Reaney, Patricia (4 March 2013). "Factbox: Record number of billionaires make Forbes 2013 list". Reuters. Retrieved 5 March 2014. ^ a b c d e f "Forbes rich list 2012: Carlos Slim tops rich list for third year". The Telegraph. 8 March 2012. Retrieved 8 March 2014. ^ "Spanx creator Sara Blakely becomes youngest woman on Forbes Billionaires List". Fox News Channel. 8 March 2012. Retrieved 8 March 2014. ^ a b Kroll, Luisa (7 March 2014). "Forbes World's Billionaires 2012". Forbes. Retrieved 8 March 2014. ^ a b c Bates, Daniel (11 March 2011). "Facebook's fortunes skyrocket on Forbes billionaires list... but no one can beat Carlos Slim". Daily Mail. Retrieved 13 March 2014. ^ a b Georg Szalai (9 March 2011). "Steven Spielberg, Oprah Winfrey Drop in Forbes Billionaire Ranking". The Hollywood Reporter. Retrieved 15 March 2014. ^ Herbert, Geoff (10 March 2011). "Forbes' 2011 list of 'World's Billionaires' is biggest ever". Syracuse Post-Standard. Retrieved 15 March 2014. ^ a b c d Miller, Matthew; Kroll, Luisa (10 March 2010). "Bill Gates No Longer World's Richest Man". Forbes. Retrieved 25 March 2014. ^ a b c d "China ranks No 2 on Forbes billionaires list". China Daily. 11 March 2010. Retrieved 17 March 2014. ^ "The Giving Pledge List Reaches $365 Billion". Insatiable Fox. Retrieved 23 April 2016. ^ Confer Thomas Philippon. ""The future of the financial industry"". Finance Department of the New York University Stern School of Business. ^ "Greenspan Kennedy Report – Table 2 – Sources and Uses of Equity Extracted from Homes" (PDF). Retrieved 1 May 2010. ^ "The World's Richest people". 10 March 2005. Retrieved 28 April 2006. ^ Miller, Matthew (6 May 2009). "The Wealthiest Black Americans". Forbes Magazine. Retrieved 21 September 2013. ^ "Special Report on The New Rich". The Economist. 14 June 2001. ^ "Special Report on The Rich". The Economist. 4 April 2009. ^ "Global Wealth Report 2011" (PDF). The Boston Consulting Group. 31 May 2011. Archived from the original (PDF) on 23 September 2015. ^ "World Wealth Report 2011" (PDF). Capgemini and Merrill Lynch. 22 June 2011. Archived from the original (PDF) on 3 November 2011. ^ a b "Billionaires 25th Anniversary Timeline – Forbes". Forbes. Retrieved 31 May 2015. ^ a b Dolan, Kerry A.; Kroll, Luisa (3 March 2014). "Inside The 2014 Forbes Billionaires List: Facts And Figures". Forbes. Retrieved 31 May 2015. ^ a b Kroll, Luisa (4 March 2013). "Inside The 2013 Billionaires List: Facts and Figures". Forbes. Retrieved 31 May 2015. 2000–2010 Top 10s: Rogers, Simon (11 March 2010). "Forbes rich list: ten years of top tens". The Guardian. 2011 Top 10: "The World's Billionaires 2011". Forbes. 2012 Top 10: "Forbes rich list 2012: top 50". The Telegraph. 8 March 2012. 2013 Top 10: Durgy, Edwin (4 March 2013). "The World's Richest Billionaires: Full List Of The Top 500". Forbes. 2014 Top 10: "Forbes Releases 28th Annual World's Billionaires Issue". Forbes. 3 March 2014. Retrieved 3 March 2014. 2015 Top 10: "Forbes' 29th Annual World's Billionaires Issue". Forbes. 2 March 2015. Retrieved 12 March 2015.